Maximizing a UV LED’s peak irradiance is imperative in many UV curing applications. More power can improve production speeds and increase throughput. In these applications, UV LEDs are often arranged into linear arrays, where they are placed side-by-side in a row, and are usually protected by a flat window or an optic. We wondered, is there an opportunity to increase the peak irradiance of UV LED linear arrays? How can we maximize peak irradiance? Do all optics perform the same? Should you even use an optic? To find out what type of optic would maximize UV LED peak irradiance best, we simulated a UV LED linear array paired with three types of optics: whole cylindrical quartz rods, sliced cylindrical quartz rods, and a custom molded UV glass optic. In this article, we compare these different optical solutions and present the results of our study. Optics are commonly used to both protect an array and to control an LED’s light distribution. In UV applications, optics are commonly made out of quartz or glass since these materials can transmit into the UV region of the electromagnetic spectrum without significant degradation. Other materials, such as plastics, can degrade when exposed to high-intensity UV light or when exposed to the chemicals used in curing. Quartz and UV glass optics can be designed to refract the UV energy to specific areas on a cure surface. Quartz rods, half rods, and custom glass optics produce unique light distributions that are suitable for a variety of applications. Below, we review these different optics and the benefits or limitations that they provide. If your goal is to collimate light from a linear UV LED array, a whole quartz rod might be your first choice. Whole quartz rods produce a nearly collimated beam of light, which enables them to be used with varying working distances. The end user can also achieve a higher peak irradiance compared to an array without an optic. There is a small amount of internal reflection losses from the exiting surface of the rod. A significant portion of the UV light produced by the LED misses the rod completely. We discuss both these limitations in greater detail in the upcoming results section of the article. Quartz rods are often sliced into halves that can be paired with linear arrays. The incident side of the quartz optic then becomes a flat surface that does not allow the light to collimate as much as the full quartz rod. Half rods are typically used in applications where producing a specific-size irradiance pattern is necessary and using a quartz rod would create a pattern that is too small for the application. In comparison, if no optic is used, the UV LED array’s light distribution is similar to a flood light. A sliced quartz rod produces an irradiance pattern somewhere in between; it is smaller than a linear array of wide angular distribution LEDs but larger than a quartz rod’s irradiance pattern. Both whole and sliced quartz rods offer little flexibility in their optical design. Quartz is a very hard material; this characteristic can be very beneficial for some applications where durability is a priority. But because quartz is so hard, it is difficult—and expensive—to fabricate or machine. Slicing the rod is typically the extent to which quartz rods are fabricated. Unlike quartz, glass has unique material properties that enable it to be molded into complex and contoured shapes. Because of this flexibility, optical features can be molded into both the incident and exiting sides of the optic. This increases the ability of molded UV glass optics to control the light distribution. As a result, when this optic is paired with a UV LED array it can produce irradiance patterns that are narrow, wide, somewhere in between, or a unique shape. In other words, you are not limited to a particular irradiance pattern. In this study, we examine optics for linear arrays but molded UV glass optics can be paired with any array, including 2D or 3D arrays. The inherent flexibility of molded UV glass optics allows the optical design to be optimized for efficient light control. In this study, we compare the peak irradiance produced by each optic. A ray trace simulation with a linear UV LED array was performed. The same LED array was used with each optic. The LED array spanned 100 mm. Each LED had an emitting area of 1 mm2 and produced a flux of 30 mW at 300 nm. Nine LEDs were placed 10 mm apart. To provide an equal playing field for comparison, the optics were each placed at a focal length of 1.5 mm away from the LED array and the resulting irradiance pattern was measured 24 mm away from the LED array on a 30 mm by 100 mm area that is referred to as the cure surface. As a starting point, the LED array was measured without an optic. The irradiance pattern from the array was broad; it produced a flood-like effect as a result of the packaged LED’s light distribution. The only area that was considered during measurements was the 30 mm by 100 mm cure surface area. The most notable value is the peak irradiance, which was 61.01 W/m2. Each optic was simulated with this LED array. The table below outlines each optic and the resulting irradiance pattern. The main areas of interest in this study were the peak irradiance and normalized peak irradiance. Optic Description No optic, only the LED array. The cylindrical rod was 10 mm in diameter, and it was positioned 1.5 mm away from the LED emitting surface. The cylindrical rod was 10 mm in diameter, and was sliced axially. The flat surface was the incident surface, and it was positioned 1.5 mm away from the LED emitting surface. The UV glass optic had multiple aspheric surfaces and used total internal reflective (TIR) surfaces to reflect rays that the other optics missed. The incident surface was positioned 1.5 mm away from the LED emitting surface with the LED sitting closely between the two TIR incident surfaces. Each optic showed several benefits when paired with a UV LED linear array. However, with most of the optics, some limitations were observed. The quartz rod collimated the emitted flux more effectively than a half quartz rod and better than just the LED array without an optic. It yielded a significant increase in peak irradiance; up to 321.04 W/m2. Additionally, the quartz rod had a very small reflection loss of only 5.7% which makes the rod efficient at refracting the captured flux. Despite increasing the peak irradiance substantially, the quartz rod has a major limitation. If the rod is paired with an LED that has a wide angled light distribution, the quartz rod will miss a lot of the emitted flux. In this study, 20.6% of the emitted flux was not captured by the quartz rod. Regardless if you’re using a high- or low-efficiency UV LED, losing more than 20% of the emitted flux is a major disadvantage. The sliced cylindrical quartz rod, when placed close to the light source, as in this study, refracted the most flux, 75.9%, on to the cure surface. It also produced an irradiance pattern that was more narrow than the LED array alone but broader than the other optics. This could be useful for particular applications. The irradiance pattern for this optic can also be viewed as a limitation. Because of the spherical radius of curvature and the flat incident surface, the pattern is much broader than any of the other optics. This optic produced the lowest peak irradiance value: 130.39 W/m2. Also, this optic does not have much opportunity for modifications since it is limited in its curvature. This limits the optics’ ability to refract the flux that it captures. The molded UV glass optic contains aspheric surfaces that produced the highest peak irradiance value: 399.89 W/m2. It is 25% higher than any other optic in this study and 555% higher than what the LED array produces without an optic. The irradiance pattern of this optic is not limited as it is with the whole and sliced quartz rods. The molded glass optic can be easily modified to create different types of irradiance patterns and has the most flux incident on the optic at 99%. This creates an opportunity to focus more flux to the cure surface or to create wider irradiance patterns. In this case study, the glass optic focuses the reflected light to a specific point on the cure surface. Therefore, the working distance is fixed. However, glass optics can be customized for specific application requirements, including different and varied working distances. Each optic produces a unique irradiance pattern that can be used for specific applications. However, molded UV glass optics provide the most flexibility in designing irradiance patterns. The molded UV glass optic captured the most flux, produced the highest peak irradiance, and has the most potential to be modified because of its material properties. Quartz rods, whole and sliced, do offer some benefits as outlined in the previous section and can be useful whenever an application does not require a specific irradiance pattern or peak irradiance. Do I need an optic to achieve my desired light output? How much more power, uniformity, area, etc. do I require and how beneficial is this increase to my UV curing system? Which optic will most efficiently capture all light? What are the surface reflection losses? And can they be improved? Do I have a fixed or flexible working distance / focal length? What is my desired irradiance footprint? Do I have a required peak irradiance? Does the irradiance pattern need to be uniform? To what degree? As demonstrated, when controlling light is needed, a custom designed, molded UV glass optic offers design engineers more flexibility, greater light control, and increased irradiance. The advent of UV LEDs has created exciting new opportunities for UV curing; we’re eager to collaborate with those seeking to develop new UV LED lighting systems. 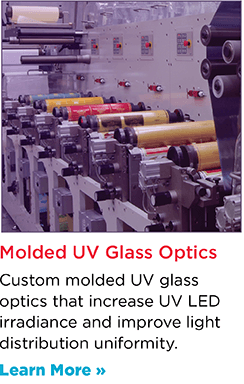 If you have questions about molded UV glass optics or would like to learn more about the benefits that they provide to a UV LED lighting system, contact us and speak with our team of experts. Together, we can develop an optical solution for your UV LED lighting project. Sharayah Follett As the Market Development Manager at Kopp Glass, Sharayah focuses on uncovering and developing growth opportunities involving emerging technologies. Sharayah’s role is unique; it allows her to collaborate directly with customers to understand their needs and then apply those insights to develop and execute marketing and sales strategies. Sharayah earned both her B.S. in Marketing and Masters of Business Administration (M.B.A.) degrees from Clarion University of Pennsylvania. Sharayah leads an active lifestyle; when not at work she can be found teaching spinning and boot camp classes or trying out new fitness classes and healthy restaurants around Pittsburgh.